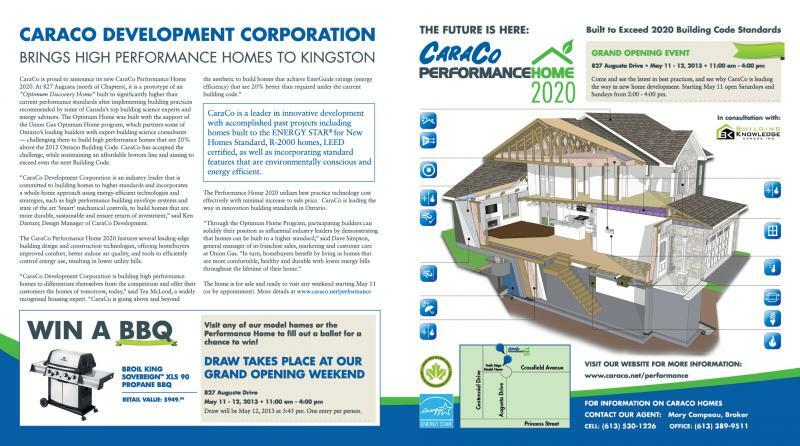 CaraCo Development Corporation has unveiled a new high performance model home built to exceed 2020 standards. Based on a sample calculation, a 2,300 sqft two storey home built in 1982 (Energuide 50) consumes about 4,250 cubic metres of natural gas per year (heating and hot water). A similar 2,300 sqft home built to Current Building code uses about 2,600 cubic meters. The similar house designed to meet Energuide 83 will use about 1,700 cubic meters of gas per year. On gas alone, that is a savings of 60% over a house built in the 1980s, and 35% savings over a newly built home. The CaraCo Performance Home 2020 is aiming to exceed Energuide 83. When you include improved comfort, and electrical savings, that is something to brag about! Click here to download our Performance Home brochure.